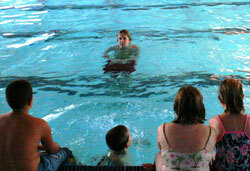 Information about swimming lessons at City of Albuquerque pools. Child classes are organized by "pods," or skill levels. Children over the age of 5 are divided into waves based on skill level. When your child masters the skills listed below, he or she will earn a certificate and move to the next wave. Students focus on being comfortable in the main pool, 3ft deep, while working on the basics of floating and kicking. Students learn fundamentals of freestyle and treading water. After completion of this course, students should be able to swim 10 - 15 yards of coordinated freestyle. Students learn to become comfortable on their back and coordinated backstroke. After completion of this course, students should be able to swim 10 - 15 yards of coordinated backstroke and 15+ yards of freestyle. Students learn coordinated breaststroke and diving. After completion of this course, students should be able to swim 10 - 15 yards of coordinated breaststroke, 25 yards of freestyle and backstroke, and treading for 1 minute. Students learn coordinated butterfly. After completion of this course, students should be able to swim 10 - 15 yards of coordinated butterfly, 15+ yards of breaststroke, 25 yards of freestyle and backstroke. This class is designed to provide those skilled young people the opportunity to become more comfortable in the water and experience 5 different aquatic adventures in 5 days! These daily adventures will go through an introduction of some of the popular activities that are usually found in the pool and open water areas. Prerequisites for participation: Must be able to swim 25 yards unassisted. Learn and master the basic skills of competitive swimming. Students will participate in organized swim meets and a City Championships at the end of the summer. Click here to find more information. We do not offer private swim lessons at any of our pools. Registration will start on Saturday April 27, 2019 at noon. When outdoor pools open on May 25, 2019, registration will then continue at all pools. Lessons are $35 per child per 2 week session. For more information on swimming lessons, call the pool of your choice. 2015 Galena SE - View map. 11001 Camero NE - View map. Parent - Tot I, II, III, and IV 10:15 - 10:50 a.m., 11 - 11:35 a.m. I and II 5:10 - 5:50 p.m., 6:00 - 6:40 p.m.
Preschool I, II, III, and IV 10:15 -10:50 a.m., 11 - 11:35 a.m., 11:45 - 12:20 p.m.
Child I, II, III, and IV 10:15 - 10:50 a.m., 11 - 11:35 a.m., 11:45 - 12:20 p.m.
Child Intersession 11:00 a.m. - 12:00 p.m. Aquatic Team Begins June 3 2019 Swim Team: 7:30 - 9 a.m. Water Polo: 9 - 10 a.m.
400 Jackson SE - View map. Parent - Tot I, II, III, and IV 10:15 - 10:50 a.m. I, II, and III (Monday - Friday) 6 - 6:35 p.m., 6:45 - 7:20 p.m.
Preschool I, II, III, and IV 10:15 - 10:50 a.m.
Child I, II, III, and IV 10:15 - 10:50 a.m.
10100 Lomas NE - View map. I and II 5:15 - 5:55 p.m. I and II 4:30 - 5:10 p.m., 5:15 - 5:55 p.m.
Child Intersession 10:10 - 11:10 a.m., 11:20 - 12:20 p.m. Aquatic Team Begins June 3 2019 Swim Team: 8 - 9 a.m. Water Polo: 9 - 10 a.m.
5301 Palo Duro NE - View map. I, II, and III 5:15 - 5:55 p.m.
Preschool I, II, III, and IV 9:30 - 10:05 a.m., 10:15 - 10:50 a.m., 11 - 11:35 a.m.
Child I, II, III, and IV 9:30 - 10:05 a.m., 10:15 - 10:50 a.m., 11 - 11:35 a.m. Aquatic Team Begins June 3 2019 Swim Team: 7:15 - 8:45 a.m. Water Polo: 8:45 - 9:30 a.m.
1410 Iron SW - View map. Parent - Tot II & III 10 - 10:35 a.m.
II 5:15 - 5:55 p.m.
Preschool I, II, and III 10 - 10:35 a.m.
Child I, II, and III 10 - 10:35 a.m. Aquatic Team Begins June 3 2019 10 - 11 a.m.
7801 Candelaria NE - View map. I, II, III, and IV 6:10 - 6:50 p.m., 7:00 - 7:40 p.m.
Preschool I, II, III, and IV 9:30 - 10:05 a.m., 10:15 - 10:50 a.m., 11 - 11:35, 11:45 - 12:20 p.m.
Child I, II, III, and IV 9:30 - 10:05 a.m., 10:15 - 10:50 a.m., 11 - 11:35, 11:45 - 12:20 p.m. Diving I, II, III, and IV 10:15 -10:50 a.m., 11 - 11:35 a.m., 11:45 - 12:20 p.m. Adult II, and IV 6:10 - 6:50 p.m.
5001 Montano NW - View map. I 5:10 - 5:50 p.m. I and II 5:10 - 5:50 p.m., 6 - 6:40 p.m.
Preschool I, II, III, and IV 10:15 - 10:50 a.m., 11 - 11:35, 11:45 - 12:20 p.m.
Child I, II, III, and IV 10:15 - 10:50 a.m., 11 - 11:35, 11:45 - 12:20 p.m. Aquatic Team Begins June 3 2019 Swim Team: 7:30 - 9 a.m. Water Polo: 9 - 10 a.m..
2033 Columbia SE - View map. Parent - Tot I and II 10 - 10:35 a.m.
Preschool I, II, and III 10 - 10:35 a.m., 10:45 - 11:20 a.m.
Child I, II, and III 10 - 10:35 a.m., 10:45 - 11:20 a.m. Aquatic Team Begins June 3 2019 10 - 10:50 a.m.
1505 Candelaria NW - View map. Parent - Tot I and III 10 - 10:35 a.m., 5:45 - 6:25 p.m.
Preschool I, II, III, and IV 10 -10:35 a.m., 10:45 - 11:20 a.m. I, II, III, and IV 5 - 5:40 p.m., 5:45 - 6:25 p.m.
Child I, II, III, and IV 10 -10:35 a.m., 10:45 - 11:29 a.m. Diving III and IV 10:45 - 11:20 a.m. Adult III 5:45 - 6:25 p.m.
6705 Fortuna NW - View map. Parent - Tot I, III, and IV 10:15 - 10:50 a.m., 11 - 11:35 a.m. I, III, and IV 5:15 - 5:55 p.m., 6:10 - 6:50 p.m.
Preschool I, III, and IV 10:15 - 10:50 a.m., 11 - 11:35 a.m., 11:45 - 12:20 p.m.
Child I, III, and IV 10:15 - 10:50 a.m., 11 - 11:35 a.m., 11:45 - 12:20 p.m. Diving I and III 11 - 11:35 p.m.
Adventures in Aquatics July 1-5 2019 9 - 10 a.m. Kids Triathlon July 1-5 2019 9 - 10 a.m. Aquatic Team Begins June 3 2019 8:00 - 10:00 a.m.
6000 Anderson SE - View map. Preschool I, II, and III 11:15 - 11:50 a.m.
Child I, II, and III 11:15 - 11:50 a.m. Aquatic Team Begins June 3 2019 9 - 11 a.m. The cost for each session is $35. Registration begins December 1, 2018 for all pools except Los Altos (begins March 16, 2019). Please go to play.cabq.gov to sign up. 6:15 p.m. - 6:50 p.m.